The fall of Constantinople that occurred on 29 May 1453 was the final phase of the Byzantine-Ottoman Wars (1265-1453) and the darkest page in Greek history and that of the Orthodox Church. The seat of the Byzantine Empire for a millennium, Constantinople was the main target of the Ottomans. Ascending to the Ottoman throne in 1451, Mehmed II began making plans to conquer the Byzantine capital. The Byzantine empire had badly eroded after the city’s capture and sacking by the Crusaders in 1204. In 1451, the empire of Constantine XI — the city being named after his ancestor — had been reduced to the area around Constantinople as well as a large part of the Peloponnese in Greece. Already possessing a fortress on the Asian side of the Bosporus, Mehmed began construction of one on the European shore known as Rumeli Hisari. Taking control of the strait, Mehmed’s ships cut off Constantinople from the Black Sea and any potential aid that might have come from Genoese colonies in the region. Constantine was forced to appeal to Pope Nicholas V for aid. Despite centuries of animosity between the Orthodox and Catholic churches, Nicholas tried to help but his efforts were fruitless as many of the Western nations were engaged in their own conflicts and could not spare men or money to aid Constantinople. Minor help came from groups of independent soldiers. Among these were 700 professional troops under the command of Giovanni Giustiniani. Constantine reinforced the massive Theodosian Walls and the walls in the northern Blachernae district. To prevent an attack from the sea against the Golden Horn walls, he ordered for a large chain to be stretched across the mouth of the harbor to block Ottoman ships from entering. Short on men, Constantine decided to put most of his soldiers to defending the Theodosian Walls. Mehmed’s army numbered somewhere between 80,000 and 120,000 men by the time they approached the city. At the same time, the Ottoman fleet was in the Sea of Marmara, ready to attack. In addition, Mehmed had a large cannon along with several smaller guns. 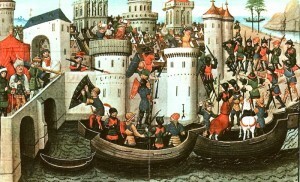 The Ottoman army arrived outside Constantinople on April 1, 1453, and began to set camp the next day. On April 5, Mehmed arrived with the last of his men and began making preparations for besieging the city. While Mehmed had the bulk of his army surrounding Constantinople, he sent troops to clear the region of minor Byzantine outposts. The large cannon began to batter the impenetrable Theodosian Walls, but with little effect. The gun required three hours to reload, giving enough time to the Byzantines to repair the damage caused between shots. On the water, the Ottoman fleet was unable to penetrate the chain and boom across the Golden Horn. Mehmed ordered that several ships be rolled across Galata on greased logs. The Ottomans managed to get the ships around the Genoese colony of Pera, thus putting them to refloat in the Golden Horn behind the chain. Constantine replied by sending fire ships to attack the enemy fleet. The Ottomans, however, were forewarned and defeated the attempt. Constantine was then compelled to shift men to the Golden Horn walls which weakened the land defense of the city. Failing to penetrate the Theodosian Walls, Mehmed ordered his men to dig tunnels to mine beneath the Byzantine defenses. The Byzantines were prepared and replied with digging countermines and intercepted the Ottomans under the ground, managing to complete the destruction of all mines on May 25. Even though the defense of Constantinople was successful for the most part, the Byzantines lost morale when they found out that there would not be any help coming from Venice. 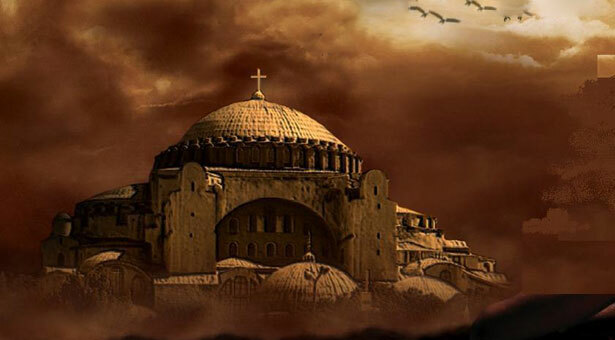 In addition, a series of omens including a thick, unexpected fog which blanketed the city on May 26, were taken as a sign that Constantinople was about to fall. The Byzantines believed that the fog masked the departure of the Holy Spirit from the Hagia Sophia. Mehmed was also disillusioned by the lack of success in taking the city. On May 26, he called his commanders and after talks they decided for a massive assault on the night of May 28 after a period of rest and prayer. Shortly before midnight on May 28, Mehmed sent his auxiliary troops forward. They were intended to wear out the defenders and kill as many as possible to weaken their resistance. Then the troops from Anatolia attacked the weakened Blachernae walls. They caused some damage too before they were driven back. Then it was the turn of Mehmed’s elite Janissaries to attack, but they were held by Byzantine forces under Giustiniani. The defenders in Blachernae held until Giustiniani was badly wounded. As their commander was taken to the rear, the defense began to collapse. To the south, Constantine was fighting fiercely, defending the walls in the Lycus Valley. But his position began to collapse when the Ottomans found that the Kerkoporta gate to the north had been left open. With the enemy surging through the gate and unable to hold the walls, Constantine was forced to fall back. The Ottomans poured into the city from several gates. It is believed that Constantine was killed fighting the invading enemy. Mehmed ordered his men to protect important buildings of the city and allowed them to plunder Constantinople for three days. The fall of Constantinople was the end of the Byzantine Empire. It was also a devastating blow to Christendom. Pope Nicholas V called for a crusade to recover the city, but no Western monarch volunteered. The fall of Constantinople also meant that the Christian Orthodox faith lost its stronghold, with the Catholic Church becoming the dominant religious power in Europe. 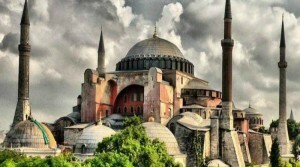 The disastrous development was also a turning point in Western history, as the fall of Constantinople is seen as the end of the Middle Ages and the beginning of the Renaissance, due to the numerous books and scholars that escaped to Europe. Greek scholars fled the city and moved to the West bringing with them priceless knowledge and rare manuscripts. The loss of Constantinople also severed European trade links with Asia, leading many to begin seeking routes east by sea and beginning the age of exploration.